Disruption is one of today’s hottest buzzwords. Disruption and continuous renewal are the norm, and changes are occurring at increasing speed. At the same time, technology or products are no longer the sole basis of competitive advantage. Rather, companies are looking into a future where customer experience is king, and technology is its subordinate. The life of the CTO, thus, is not what it used to be - they are the disruptors who need to try and stay at the top of an ever-shifting disruptive wave. In my experience, when different ideas and different ways of working meet, the result is often more than the sum of its parts. In great teams openness to share ideas, the ability to give and receive feedback meet - and the results often speak for themselves. And here’s where Spinverse steps in. 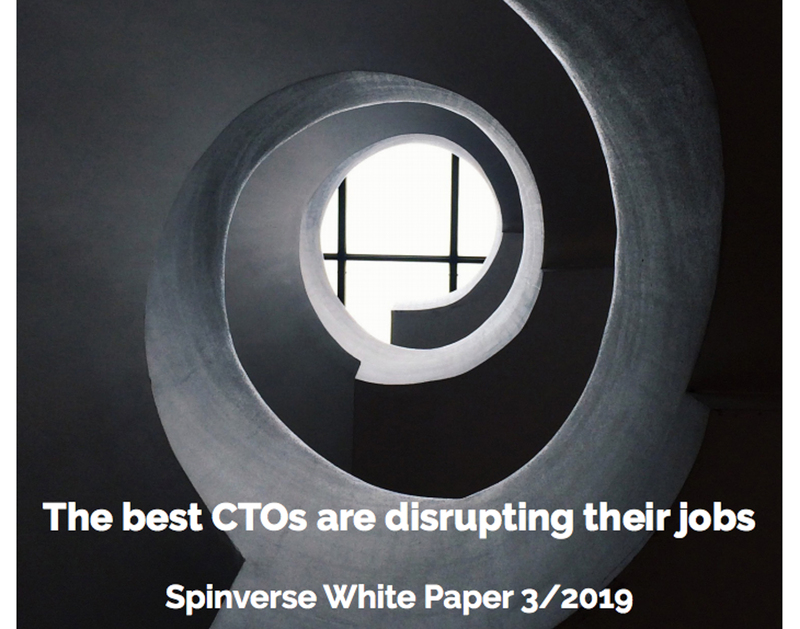 Our white paper, “The best CTOs are disrupting their jobs”, can help you in staying at the forefront of the continuously shifting disruption. In a networked world where few companies can make it alone call for the ability to collaborate and co-create, i.e. open innovation. With our global expertise and years of experience in innovation consulting, we have been able to identify factors and tools that can help the modern CTO maintain competitive edge. With these tools, you’ll get help in proactively thinking differently about your role. Open innovation may sound scary or threatening, but in fact it is a strategic competence that can be built and practiced. We have specialised in driving open innovation ecosystems, arranging funding and commercialising emerging technologies. In our white paper, we share our five steps to approaching open innovation. As I’ve seen, every innovation process starts with an idea. The road from an idea to an innovation, however, requires openness, contribution from different people and a clarity of vision for the result. As a CTO you should be bold. Have courage to work with your CxO colleagues and their teams to find the right problems to solve. Then build an innovation strategy to solve them with the right partners. In short: Disrupt your job, before it is disrupted. I hope you’ll download the white paper from here and learn more about open innovation and the role of the modern CTO. What does an open innovation ecosystem mean?When and why is an open innovation ecosystem an effective way to cooperate and create something new?What kind of leadership makes an open innovation ecosystem successful? The exponential development of technology is driving fundamental change in the world. As the pace of change is continuously increasing, people and companies need to understand the nature of exponential growth.